It's a luscious twist on a night at the movies. They've got the look and flavor of buttered popcorn with a sweet cupcake kick! Combine the powdered sugar and egg white powder in a medium bowl. Add 1 tablespoon water and mix well. Add more water, 1 teaspoon at a time, until mixture is thick. Spoon mixture into a re-sealable bag; set aside. Line 2 sheet pans with wax paper. Reserve ¾ cup of the Jelly Belly beans in a small bowl. Use a sharp pair of scissors and cut the remaining Jelly Belly beans in half lengthwise. Arrange 3 half pieces of Jelly Belly beans on the wax paper lined sheet pans into a star burst having the 3 short ends come together. Snip a very small corner, (⅛ inch), from the bag with the confectioners' sugar frosting and pipe a small dot of frosting in the center of the jelly bean arrangement. Place a whole jelly bean in the center, short end down, to look like a piece of popped corn. Continue with the remaining frosting and whole jelly beans. Let candies dry at least 1 hour. Tint the vanilla frosting with the yellow food coloring to make a pale yellow color. Spread frosting on top of the cupcakes. Gently remove the dry popcorn jelly bean arrangements from the wax paper and place 4 to 5 pieces on top of each cupcake. 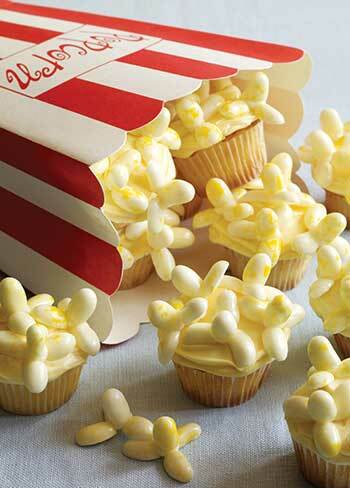 Place the cupcakes in a popcorn box to look like they are spilling out of the box.